I’m weird when it comes to museum’s. I don’t know why, but I like them. When my eighth grade class took a class trip to Washington DC, I was really mad we didn’t go to the history museum at the Smithsonian. The only place we went was the Air and Space Museum which was great, but not my thing. My parents came to town and we needed something to do. Like I explained in an earlier post, our plan was to go to Canada to gamble, but they forgot theirbirth certificates. As we were walking through Target Saturday night, I asked J what the heck we were going to do to entertain them the next day. She mentioned the RE Olds Museum in Lansing and that eventually led to The Henry Ford in Dearborn. I still want to take my dad to the Olds Museum, but that’s something we can do another time. 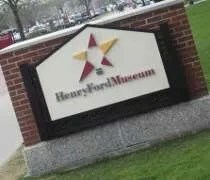 The Henry Ford is a huge complex in Dearborn that consist of a museum, IMAX theater, the Rouge factory tour and the 90 acre Greenfield Village. That’s just the attractions open to the public. There is also a research center, the Ford convention center and probably more things I don’t know about. The complex is located on Oakwood Boulevard just a mile or so off Southfield Freeway. The Lansing State-Journal is running a story today about the reopening of the popular entertainment venue in East Lansing. Small Planet, located at 16800 S. Chandler Rd., Suite 109, opened it’s doors at 3:00 for the first time in eight years. The first act will be Mason’s Case. Cover is $5 for those 21 and over. Besides being a place for live music, Small Planet will have a full menu and bar, but they’re only open for dinner with a happy hour from 3:00 to 7:00 on weekdays.